When I was about the age of young Sylas Tate I had a thought – what if the reason we can sometimes be so doubting, so unsure of ourselves, is that we aren’t quite whole? As I got a bit older the idea started to develop: what if the other part of us had a world of its own? And what if this other world was in some ways just the same as ours but in others was utterly different, even opposite? Those thoughts stayed with me and over the years they became bolder and bigger: what might those double worlds of dual souls allow me to explore and explain? Myths and legends? Even some of our basic ideas – science, magic, the supernatural? 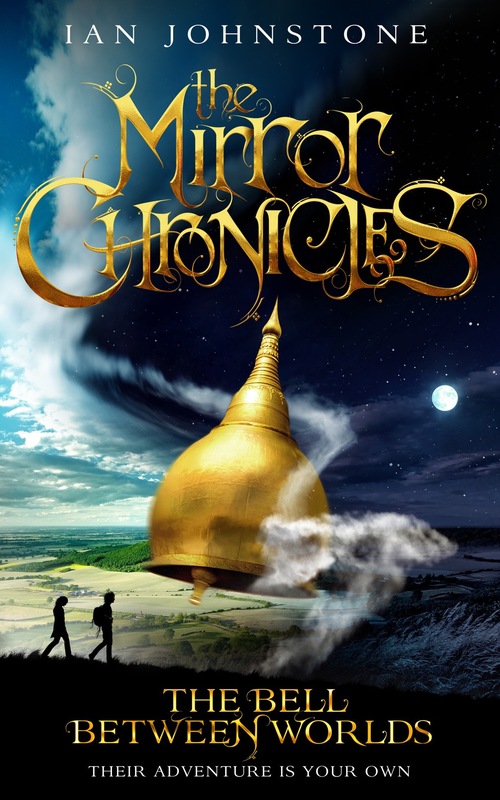 Eventually I had so many nagging ideas that I knew I had to write them down, so I changed my own world, moving from publisher to writer, and began The Mirror Chronicles. I started by preparing the history and background of this other world and then I moved on to the first book, The Bell Between Worlds. This opening novel takes Sylas Tate into another world of possibilities, imaginings and second souls and brings him face to face with many of the questions I asked myself years before. Happily for Sylas he also finds some of the answers. A draft of the hardback cover for the Bell Between Worlds.